Romancing Hearts for Valentine’s Day! Since we have some very creative people that post here on Smugmug and in honor of Valentine’s Day Week, I challenge each of you to post a unique image relating to Valentine’s Day. Hearts, Love, Romance, Cupid……….. you get the gest of it. Here is my post! I found these two White Egrets romancing each other at Smith Oaks Rookery near High Island, Texas last March. During all their romantic activity, they created a heart shape with their necks and I happened to unknowingly capture it. I look forward to viewing your creative image! 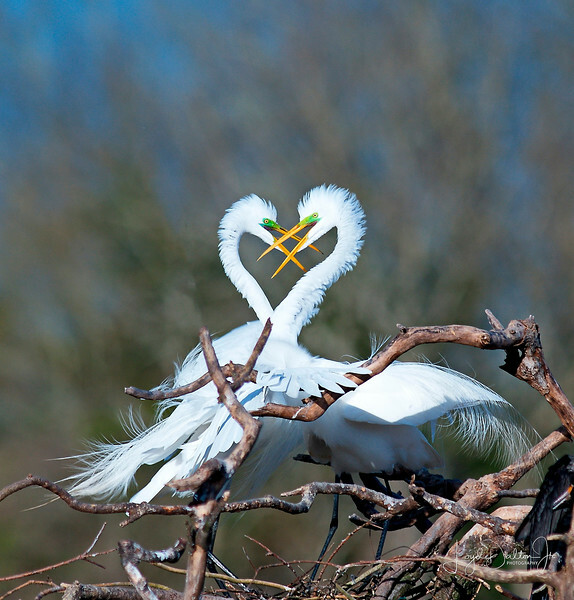 Love the romantic pose of these egrets, forming a perfect heart. Good eye for noticing it and putting it out for a Valentine's Day challenge. Perfect timing to capture the heart shape in the pose...beautiful! I will have to see what I can come up with for the challenge. Super shot of these two and great suggestion for the challenge....have to see if I can come up with something!